This was the best mouse I have ever used, bar none, and I've been through quite a few mouses. 20 million right-clicks and many left-clicks at least in total. The main reason I extoll so nostalgic about Best Mouse asides from having many late night conversations with the rodent, is that ergonomically it had a large enough ledge to rest your thumb on. Another reason was the number of extra buttons to program routine commands that are usually done on the keyboard. Unfortunately the manufacturer discontinued this particular model. I happened to search online for the same mouse and stumbled upon a few that were advertised as *new*. That made me happy. Alas, twas' but for a fleeting moment. The sellers were asking $200 for Mr. Best Mouse. Still speechless. I like the mouse that came with my new Dell, purchased several months ago. It feels right in my hand and is easy to navigate. gigi- you ought to have tired this one when they still sold it. No ka oi. 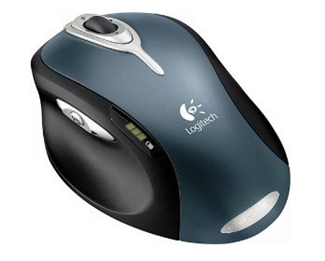 I have the cheaper Logitech M510 which I absolutely LOVE! It's the first time I've owned a wireless mouse and really, really LOVE LOVE it. Kay- Been there. Those wireless mouses were a new-ness experience. That looks like a really nice, comfortable mouse. The last mouse I had was a Logitech. I used the hell out of it for 3 and a half years before the left click button started to stick on me, doing double clicks when I only wanted a single click. I replaced it with a Microsoft mouse, because it was the only one I saw with a back button on the side. I'll probably replace it soon though. It doesn't fit my hand comfortably. Brad- many people have claimed it's the most comfortable mouse they've ever used also. I had thought of buying a second MX 1000 mouse fully aware of manufacturers' penchant to discontinue even best selling items for more glitzy new designs, but they were selling for something like $95 each even then. Rowena- oh no, it's an honest valuation. Apparently the mouse has attained a cult like demand. 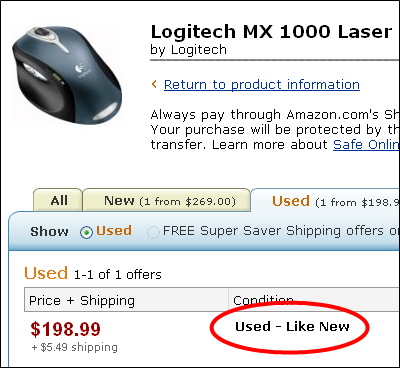 If the seller sold a "new" mouse cheap, the buyer would only turn around and sell it for $200+ to a collector, aficionado. Now, I don't know how long the non-replaceable lithium battery will stay working. The mouse shell is sealed and the battery has to have a shelf life. There are a lot of used Logitech MX 1000 mouses on the market from China and Hong Kong for some reason. Yesterday, I offered a seller on the mainland $25 plus shipping for his used MX 1000 mouse, but he preferred to wait for 4 days when the bidding officially ends, the posted end of bidding on Ebay for that item. He didn't have a buy-it-now price. How much did yours originally cost? Nate- O' the mouse was $95 five years back then. You could buy a nice keyboard with a standard mouse for the same money.